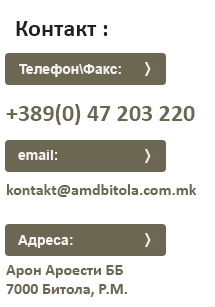 AMD "Gjorgi Naumov" - Bitola is founded in 1946 . It has two modern stations for technical inspection of vehicles equiped with devices from German manufacturer MANA and provides the following services. This services are avaliable by professionally qualified stuff to ensure maximum professional level in performing this services for our clients..